Come on person, we’ve got to get to work. Today is a really special holiday, but it came on the wrong week. Why didn’t it come last week? You see, today is Take Your Dog to Work Day. And you know where my person is working this week? She’s working at home playing catch-up with all the things that she didn’t get done last week. Because last week she was working at Vacation Bible School all week. With all those kids and weird animals. That’s where I wanted to go to work. I would have even dressed up as a weird animal if I had to. But I think those kids would have liked me no matter what. I guess I’ll have to take my person to work with me instead. My work is on my trails – where all my adventures lay waiting for me. But while you’re waiting for me to come back and report on my next adventure, I thought I’d share a song with you. It’s a special song for today. Just click on this link: http://www.takeyourdog.com/audio/2012-TYDTW-Song.mp3 and take your dog to work. Marina, my person just found this song yesterday. We didn’t know there was a song either. And I made her watch the video, but she says if she took me to work all dogs would be banned from the place from then on. I don’t know what she’s talking about. But my tummy is all better now. Thanks. Ahhh man!!! Don’t tell Wall-E Bongo. I left him at home today with his human sister. Since she’s on vacation, she did take him to work? Does that count? Kimberly, I don’t think Wall-E will mind since he’s not left home alone. But maybe you should take him to work with you another day. I think I’m jealous of Wall-E.
Bacon, I’m checking on that Bring Your Pig to Work Day. We might have to create one. There’s a couple pigs here though that I think are trying to take over my work blog. You might want to check out my post tomorrow. Lily & Edward, my person did end up going to work for awhile today and she said I couldn’t come. Us dogs have got to join together and do something about this. Will and Eko, as long as my workplace is on my trails, I’m working every day. Sorry you didn’t have any luck going to a work adventure with your person, B. 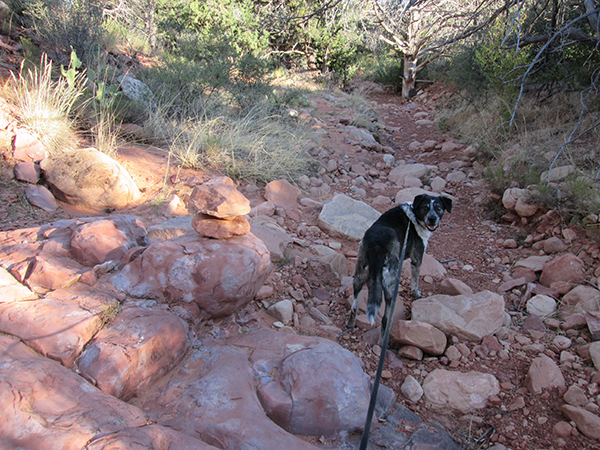 Being out on the trails is really kind of like your job, so …..
Cupcake, I’m heading to work now. Be back later. Kevin, I bet if you went to work with your mom all those sick people would get better for sure. Little Binky, you can come, but the cats I live with aren’t allowed. Chancy and Mumsy, we didn’t know about that song either until my person started checking out the Take Your Dog to Work Day website. And yes, she got lots of work done with me around.